Nez: Malté, réglisse Bouche: Maltée, caramel, réglisse, fruits noirs, liquoreuse Une bonne bière et attention à ne pas se faire avoir par "Joyeusement Houblonnée"
33cl bottle from La Cave à Bulles. Hazy opaque brown with a dense fluffy head. Roasted malts, lots of toffee, hints of licorice and smoke. Medium to low sweetness with a drier, roasted and very hoppy finish. medium bodied, average carbonation, filling palate. I don’t remember anything close to this one, but this is a very pleasant and drinkable beer. Very fruity beer, with a solid hoppy character. Smooth and highly drinkable. We’ll worth a second try! Bottle, 33cL. Home. A very dark brown beer with a big beige head ; medium retention. Roasty aroma, fruits (blackberry, quince), smoke, herbs, caramel. Medium to heavy dry bitter. Medium body and texture, good carbonation, bitter finish with fruity notes. Overall, very pleasant "smoky" "hoppy" french beer. Red pour with a big single finger head. Lots of lace. Sugary aroma full of caramel and dark fruit. Taste is nutty. Caramelized banana, almond liquer. Really sweet but easy to drink. Full mouth. Bottle at "l’Archou" pizzeria - St Jeures Brownish beige head with hops and candy flavors. Dark opaque copper body. Lots of hops and some coffee in mouth. 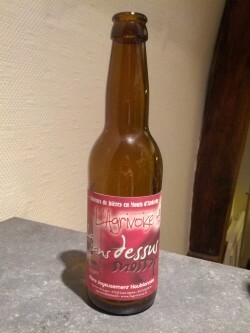 Bière brune rougeâtre sous une mousse persistante beige; belle dentelle; arômes de houblon avec des notes de fleurs et amandes; corsé en bouche, ronde et crémeux; amertume importante sans etre exageree ni agressive. Notes de fruits sur la saveur. Bottled, from La Cave à Bulles, Paris. Cloudy ruby, rich head. Caramely nose. Sweet with mediu mbody and rounded mouthfeel. Some butter, plenty of caeamel, notes of red berries. Low bitterness. Mild and very caramelly.